Due to rapidly aging cultural property administrators, it is becoming increasingly difficult to conserve and manage cultural assets year after year in Sakegawa Village. They came to the Institute on September 13th to find solutions to be reflected in their cultural property protection program. 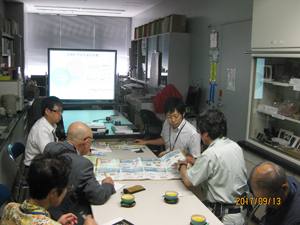 The members visited the Biological Science Section and others to receive briefings from the staff in charge.